This image from NASA's Swift space telescope, taken on Jan. 22, 2014, shows the supernova SN 2014J as seen in three different exposures by the space observatory. Scientists suspect the weird supernova's progenitor star may have had a helium belt. Light from a radioactive metal forged inside a supernova blast could prompt a rethink of how some star explosions occur. The supernova SN 2014J is located 11.4 million light-years from Earth in the galaxy M82. Astronomers used the European Space Agency's International Gamma-Ray Astrophysics Laboratory (INTEGRAL) spacecraft to examine the star explosion's light spectrum in the gamma-ray bands and saw elements that shouldn't have been there — suggesting that widely accepted models of how such events happen might be incomplete. Over time, the gas piles up on the white dwarf until enough pressure and heat build up and ignite fusion reactions. The hydrogen becomes helium, and then the helium goes through the "triple alpha" process, fusing into carbon and oxygen. Since the fusion is happening very quickly and the gravity of the white dwarf is so large, there's not enough time for the gas to expand and the stuff on the white dwarf surface explodes. The explosion is so powerful that it disrupts the white dwarf's interior, obliterating it and seeding the rest of the universe with heavy elements. What the Max Planck team saw was a gamma-ray signature of nickel-56, a radioactive isotope of the metal that emits gamma rays as it decays into cobalt-56. 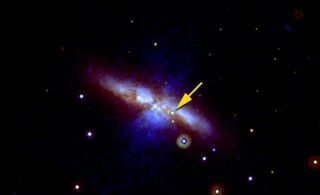 It has a half-life of only about six days, but the gamma rays were still visible 15 days after the supernova blew up. "We were observing it and after about three weeks most of nickel-56 would have decayed," said Roland Diehl, lead author of the study. "The nickel-56 would be cobalt. But we saw the gamma-ray line… Some of our colleagues said that can't be true." The two images at left and center show the central portions of galaxy M82 prior to the supernova explosion. The right image shows supernova SN2014J taken by the FLITECAM instrument on the SOFIA observatory on February 20, 2014. The spectral line was also narrow and sharp, when it should have been wider and more diffuse – the result of moving toward the observers along the line of sight in the wake of the explosion. The blast should have also been relatively symmetrical. But it wasn't. That led Diehl and his colleagues to think there had to be a "belt" of helium around the white dwarf's equator, which would account for the supernova's shape. Seeing the nickel could be explained if the view was pole-on, so that the helium fusing into other elements such as carbon and oxygen wouldn't block the light from the nickel. The hypotheses in Diehl's study also depend on the accretion of mass being relatively fast. Too slow and the white dwarf turns into either a more massive dwarf or a neutron star. On top of that, any gas that reaches the surface of a white dwarf tends to "flatten out" and cover the surface evenly because the gravity is so strong. The next question is where the helium came from. There are two possible sources. One is a companion star, but most stars don't have a lot of helium in their outer envelopes unless they are rather massive to begin with. "Usually stars with bigger [helium] cores evolve faster, so the star with the bigger core should die first," said Alexander Heger, a professor of physics at Monash University in Australia, in an email to Space.com. "The only way out would be to have a system with more than one phase of mass transfer, i.e., the star that is now the less massive white dwarf initially was the more massive star but by the time it died it had transferred a lot of mass to the companion. Such models and details of mass transfer and ejection from the system are still quite uncertain." The other possibility is a helium white dwarf, orbiting close enough to a companion white dwarf that it nearly grazes it. Helium white dwarfs are hard to create because a star that could become one on its own would have a low mass, on the order of 0.6 times the mass of Earth's sun, said Enrico Ramirez-Ruiz, a professor of astronomy at the University of California, Santa Cruz. Such stars would take so long to become white dwarfs that the universe hasn't been around long enough for them to form. Ramirez-Ruiz, who was not involved in Diehl's research, said that's why the traditional model of type Ia supernovas needs tweaking. To get the helium there is probably some kind of mass exchange between the two stars in a binary system as well as between the remaining aged star and white dwarf, and even between two white dwarf stars. Diehl's observations, he said, are the first time anyone has seen clear evidence of that kind of supernova, as well as the nickel. The nickel is important, because it shows the disruption at the center of the white dwarf, evidence for a "double detonation" model. In that scenario, the explosive fusion of the helium on the white dwarf surface produces a kind of focused shockwave that triggers yet other fusion reactions inside the dwarf, leading to the production of radioactive nickel. "It's really forced us to revisit the old models," Ramirez-Ruiz said. Their research is detailed in the Aug. 1 issue of the journal Science.